Antarctic Sea Ice At Record Levels | Watts Up With That? Increased ice cover in Antarctic continues to be at odds with falling Arctic ice levels, where the summer melt has again pushed levels well below the average extent for 1981-2010. The centre said while the rate of ­Arctic-wide retreat was rapid through the first half of April, it had slowed. The April Arctic minimum was 270,000sq km higher than the record April low, which occurred in 2007. The Antarctic sea ice extent anomalies were greatest in the eastern Weddell and along a long stretch of coastline south of Australia and the southeastern Indian Ocean. The centre said the increased ice extent in the Weddell Sea region appeared to be associated with a broad area of persistent easterly winds in March and April, and lower-than-average temperatures. Yeah but the wind ate the Antarctic warming, waaaaah !! It’s all that rapid melting taking place at -54° that’s causing ice to appear hundreds of miles off shore. All of those poor penguins now have a much farther march to make from their breeding ground in the interior to their feeding ground on the coast. We better get some global warming soon, or they’re all going to die. Just a reminder about albedo…. The 1,344,000 sq. km anomaly is nearly twice the size of Texas. Nothing to see here…move along. Just wait until the extreme human phenomena kick in later this decade. I foresee a heck of a lot of dust and radionucleides being foisted skyward. Tomorrow we will have an article that says record low ice levels and polar bears at risk! My Penguins certainly died last night. Gads, that was an ugly game. According to warmist blog trolls with limited scripts, this ice extent is just a lot of slush coming of a rapidly collapsing ice shelf (continent). By this characterization any amateur climate science voyage should be able to ply the slush fields and get in close to witness the final demise of the main ice fields. Good luck with that script. The article indicates that this “new” study used radar observations captured between 1992 and 2011. Antarctic sea ice has been growing greatly since 2011. I wonder how this affects the “irreversible state of decline”? Now let’s see how big this record is going to get. We’ll know more in a few months. Can’t wait for the next expedition looking for melting ice. But how many Manhattans is that? The bipolar seesaw has started marking the start of the descent towards the next glaciation. It will be interesting to see how large a part of that descent will be described as global warming, and with what inventiveness. Does this mean that the forecast Great Cooling has started? The other interesting place to watch is the multi-year ice in the Arctic. It seems to have bottomed out and increased some. The climate is changing with our 17 year surface temperature standstill and the cryosphere at ‘normal’. Alas, they will keep on pointing to a crumbling section of ice sheet here and a retreating glacier there to prove global warming is worse than we thought. B) reduced ice extent would lower the surface albedo. C) more absorbed sunlight (increased forcing) would increase temperatures. D) Go to A. (i.e. positive feedback). One assumes that this conventional wisdom would be the basis for feedback in climate models. Greater ice extent in the face of rising temperatures, turns the ice-albedo feedback mechanism on its head, flipping it from a positive feedback, to a negative feedback, at least in the southern hemisphere. Could this explain the divergence between models and observations, as well as the gap in their estimates of sensitivity? At the same time the New York Times writes about the coming disaster of a splintering Antarctica. Do they even compare different studies or just print what comes first? Just curious, but has anyone published a study which claims increasing Antarctic ice will be a disaster? I think it would make a nice bookend to go with all the disaster scenarios claimed for decreasing Arctic ice. 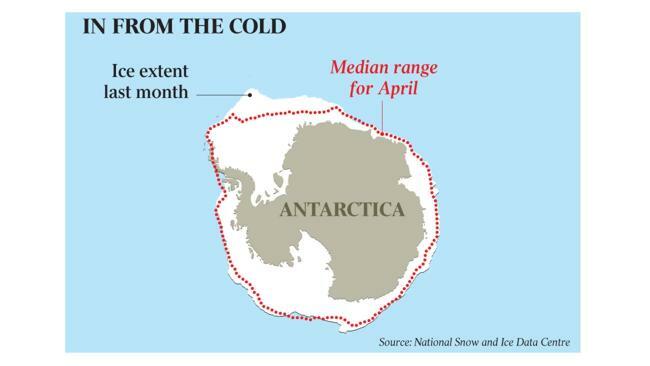 An iconic chart of Antarctic sea ice extent in April from the NSIDC which should be spread around. Your pro-AGW friends will have a momentary seizure over this one. Don’t let the ice extent fool you… polar bears are extinct in Antarctica!!! I forgot to add my comment. Weren’t global sea ice levels considered a proxy for global warming? By that score, what are they now – a proxy for the fabrication of the temperature record? Oh, I get it now, the thing that fell on Chicken Little’s head that started him flapping about “the sky is falling,” was a chunk of ice. The when and where cracks in the msm lie foundation will appear seems to be a more important thing to watch. Will they all go down with the the Ship of Lies or will some jump into a life raft of truth given the real facts to use. Right on cue; A quick visit to the Guardian and despite a record April Antarctic ice extent, their take is somewhat different…. “Western Antarctic ice sheet collapse has already begun, scientists warn. Now that is an inconvenient truth! Perhaps NSIDC did not get the memo. 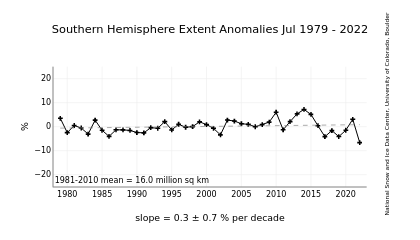 I presume they will need to adjust their ice data from previous years to reveal that the Antarctic ice has actually been decreasing for the past 30 years. Well, it is 22,800 Manhattans. Would take ten million Hiroshima bombs to melt it. Earth to NSIDC, Antarctica and the Arctic ocean are a world apart; separated by an impenetrable thermal guard ring, called the equator, which is ALWAYS much hotter than both of those places. So heat can’t propagate from the Arctic to the Antarctic, or verse vicea. It’s a very common trick in precice Temperature control, to stop heat from flowing in unwanted directions. (also works for electricity as well). So Antarctica and Arctica, are blissfully unaware of each other. The polar bears, aren’t going to show up down south, and start lunching on Emperor penguins, nor are the penguins going to swim in the Arctic ocean, after it all melts. When the expanding Ice seals off naval passages south of Africa and Latin America. Then it will be the coming ice age or subtitle;We have always been at war with Pacifica. The Artic ice is shrinking. Well la-dee-effin-dah.We are 5 weeks from summer,and the longest day of the year. Guess these idjits don’t about 24 hr sunlight. Oh wait. Real science is hard. Obviously wrong. The CBC reports the Antarctic ice sheet is collapsing. And the CBC is never wrong about Global Warming, is always fair in its reporting, and believes real data is more trustworthy that output from some computer models. Science Daily: “Ice loss moves the earth 250 miles down”. Apparently, the “lightening load” of all that ice is causing really, really rapid rebound. In fact, yes, greater amounts of ice will accelerate global cooling, as more light will be deflected away from earth. However, in addition, and more importantly, as the temperature differential between the poles and equator grows larger due to the cooling from the top, very likely something will also change on earth. Predictably, there would be a small (?) shift of cloud formation and precipitation, more towards the equator, on average. At the equator insolation is 684 W/m2 whereas on average it is 342 W/m2. So, if there are more clouds in and around the equator, this will further amplify the cooling effect due to less direct natural insolation of earth (clouds deflect a lot of radiation). Furthermore, in a cooling world there is more likely less moisture in the air, but even assuming equal amounts of water vapor available in the air, a lesser amount of clouds and precipitation will be available for spreading to higher latitudes. So, a natural consequence of global cooling is that at the higher latitudes it will become cooler and/or drier. Hence my prediction of the return of droughts to the Great Plains of America from the beginning of the next decade, similar to the dust bowl drought that started in 1932. I remember reading some time ago; don’t quite remember where, but there’s a theory been put forward, that the main reason, that there is all that ice and snow at both ends of the earth; and why it is so cold in both those places, is that there is very little solar energy reaching there, because the sun never gets very high above the horizon, so it is always passing through a much thicker oblique layer of air. Also, ice and snow aren’t all that reflective at solar wavelengths because the snow is porous, and forms TIR trapping structures on the surface, very readily. Yes open water, may absorb more solar energy, but remember that the ocean circulation transports Arctic water back to the tropics, to replace the warmer waters flowing from the gulf stream and the like. More importantly, the open ocean water is more efficient at radiatively cooling, as well as evaporatively, so a warmer Arctic ocean can do a better job at cooling, the earth, than a colder ice field can. Interesting how that one statement/comment assigns, potentially a completely different significance to the results of this study as implied elsewhere. But it’s the wrong kind of ice. And how do we know this? Because there’s more of it, and that just can’t be! At last the hidden heat . . .
Sea ice is an entirely different thing than an ice shelf, glacier, or ice sheet. While Antarctic sea ice extent get used around here as a proxy for all sorts of things, sea ice tells you very little about the current state or ultimate fate of the West Antarctic Ice Sheet (WAIS). If you want to know what is happening to the WAIS, you should observe the WAIS. That is what the NASA research has done. May, might, could, etc. etc. Well, “NASA research” doesn’t seem to have actually done much observing, but they certainly seem happy to spew a bunch of unprovable nonsense. 1. Its natural that the ice flows into the sea and reduces by melting in sea-water and forming icebergs, the important question is the rate of loss. It gets replaced by snowfall and direct conversion of water vapour to ice. 2. Antarctic ice sheet loss has probably got nothing to do with atmospheric warming, they don’t melt from above. 3. Geothermal warming from below is involved, with many subglacial lakes formed, many volcanoes in that region. The warmists will go to town on this, even though its probably got nothing to do with AGW. There is a mechanism proposed to explain how warming can cause more sea ice. The documented retreat of glaciers on the West Antarctic is purportedly putting more fresh water into the ocean reducing the salinity so that ice can form more easily. This claim must be refuted in order to say the increase in ice is proof warming isn’t happening. The “imminent” collapse of the West Antarctic ice sheet turns out to be 200-1000 years in the future according to the actual studies. Wow, the Antarctic is beginning to resemble a golf ball. Important point. Significantly I think, ice insulates. At times it seems it is a defensive reaction to cooling water. It may show a hard switch between two states. Higher heat transfer to the atmosphere and a limited transfer state. 1. “Excess” total sea ice area anomaly is now (May 8) greater than 1.050 million sq km’s. Hmmmn. An “excess” total sea ice area anomaly (which combines both the Arctic and Antarctic sea ice areas together) approaching the size of Hudson Bay. 3. By itself, “Excess” Antarctic sea ice area is now back over 1.67 Mkm^2 … a level only reached 5 times before. A level NEVER reached between 1979 and 2007 in the modern (global warming) era, but has been passed five times in the 7 years between 2007 and 2014. Obviously, the more CO2 is in the air, the more Antarctic sea ice area keep increasing, right? Combine this with the “Inconvenient Fact” that actual measured satellite global temperatures have NOT increased since 1996 … Makes Obama seem a bit – premature in claiming today that global warming is a national crisis? 4. “Excess” Antarctic sea ice area in 2014 is now (May 8) about 1.0 Mkm^2 GREATER than 2013′s sea ice area on this date last year. 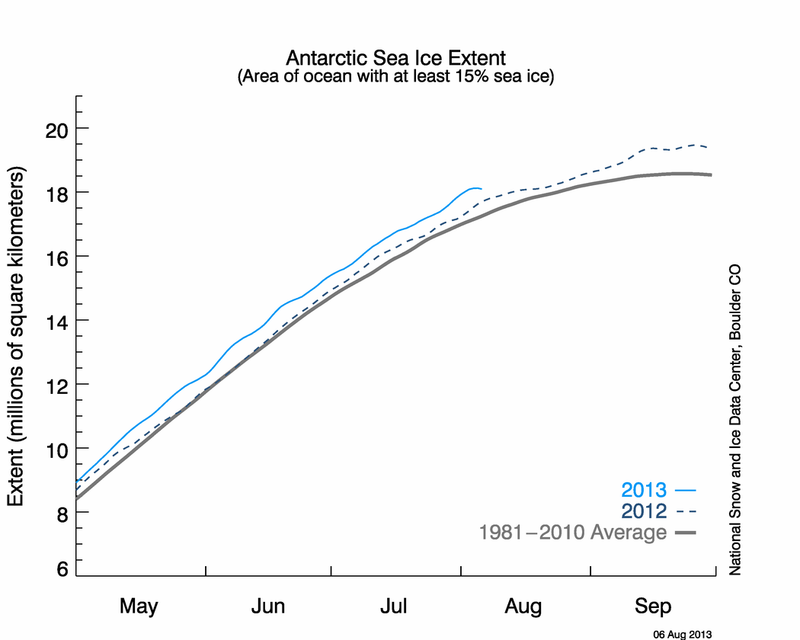 And 2013 set a record-breaking maximum Antarctic sea ice area in late December. Makes you wonder what will come later in this year. 5. And the Great Lakes sea ice – which is NOT included in the NSIDC’s “sea ice area” calculations! – has not yet melted away – but we are now in the second week in May. Steel, iron ore, coal production are already being affected, companies have already announced second quarter incomes and jobs are being affected in the Great Lakes region. Now, Arctic sea ice is of course melting, and Arctic sea ice area has been dropping since early April as it does every year. Total sunlight onto the Arctic is increasing, and will increase until June 22 – about 5 weeks from now. Arctic sea ice will continue melting through the long summer days up north. But Arctic sea ice will continue decreasing its albedo until late July – decreasing from its present 0.93 to towards its low of 0.45 or so in July. But by mid-September when Arctic sea ice is at its minimum and Antarctic sea ice will be near its maximum, the Antarctic sea ice edge will be irradiated by five TIMES as much solar energy per square meter than the Arctic sea ice edge. So, if 5 times the solar radiation falls on 1.67 million “extra” square kilometers of newly-frozen “excess” Antarctic sea ice than falls on a missing 0.4 Mkm^2 of Arctic sea ice, what happens to the planet’s total heat balance? Do we not cool off even more? 1. how do explain the fact that there has been NO INCREASE in Arctic summertime temperature since the DMI daily temperatures at 80 north started in 1959? Instead, temperatures at 80 north latitude have decreased since 1959, and are decreasing faster the more that CO2 increases. 2. At today’s levels, since open Arctic waters lose more heat than ice-covered water than open water can absorb, how do you justify any concern about Arctic ice loss? 3. If Arctic sea ice loss is catastrophic because of the difference in albedo between open water and ice-covered water, why do you ignore the past 4 year’s gain in Antarctic sea ice? The steady gain in Antarctic sea ice since 1979? 4. The WAIS is surrounded by sea ice. Justify your (NASA’s) propaganda fro catastrophic loss . How can the 300 foot thick WAIS melt out if the 2 meter thick Antarctic sea ice continues to gain area AROUND the WAIS every year the past 4 years? Here is a thermo type problem for all y’all…. Calculate the thickness of ice in a water tower place 125′ above ground and is spherical with a radius of 20′. What is the maximum thickness the ice layer will be in the tower at a steady state condition. Assume that the air temperature does not rise above 32 degrees F for 45 days. Will the tank need to be heated? If so at what rate? I am sure if left a few more assumptions off. Isn’t that exactly what’s just happened? Leo Gieger – the supposed mechanism for the melting the ice sheet is increasingly ‘warm’ sea-water, not the atmosphere. The proven requirement for increasing sea ice is colder sea-water usually concentrated by wind. What effect does logic then suggest increasing sea-ice will have on the supposed mechanism for melting the ice sheet? “Scientists” are having a field day with the “worrisome Antarctic ice sheet melt”. Some watertowers in the Northern states are heated. They can form ice inside. At the top of the figure is snow, then ice, then sea water. The temperature profile has me thinking the ice and snow are insulating. It may have started a couple of thousand years ago. It will take several thousand more. What’s the data on Antarctic ice volume? Irrelevent. Why do you ask? You are trying to make a point, but you have exactly the WRONG geometry to make your point. In your case (a spherical tower holding water high up above the ground in the midst of sub-freezing air), it is the amount of sunight received AND the air temperature that matters, NOT the layer of ice forming continuously on top of the water in the spherical tower. But … that is NOT the geometry in the high arctic. First, consider the case of 1 Mkm^2 of sea ice at the equator above the atmosphere exposed to sunlight (This is, after all, what the so-called climate scientists use their classrooms and on their mid-term exam tests). When the sunlight hits this “iceberg” in space, it reflects sunlight proportional to the ice albedo of 0.95. If that 1.0 million sq km’s of ice were to melt, the darker albedo of seawater at 0.066 would require the sea water to absorb more much heat energy and the water would heat up the air and, eventually, the earth. The Antarctic sea ice varies over the year between a latitude of 71 degrees south (at it minimum sea ice extents of 3-4 Mkm^2) and extents as far north as 59 south latitude (at its recent maximums of 19-20 Mkm^2 sea ice extents.) At these latitudes, the edge of Antarctic sea ice receives 5 times the amount of solar radiation that the edge of the Arctic sea ice does in mid and late September each year. At these latitudes of 60 – 70 south, the solar energy penetrates less atmosphere, has much less losses in the atmosphere, hits the water at high solar elevation angles every hour of the day, and is hit with substantially more solar radiation all year for more hours of every day of the year. So YES, if the antarctic sea ice edge expands – goes further north – more solar energy is reflected from the earth with each square meter of Antarctic sea ice expansion. Not so in the high arctic – particularly at the tie of minimum Arctic sea ice extents. The edge of the Arctic ice varies somewhat but can be averaged at 80 north latitude to 78 north latitude in recent years. At these latitudes in mid-September, the sun is only 8 to 10 degrees above the horizon. The albedo if BOTH water is 0.30 – 0.35 at these angles. Worse, the sunlight is trying to penetrate 8 to 14 atmosphere thicknesses at these low solar elevation angles. So their is almost no solar energy being absorbed – IF the sunlight can actually penetrate the 70% clouds found that far north at this time of year. If there are clouds, even LESS solar energy gets through to strike the top of the sea ice or water. So, if the Arctic sea ice melts, little solar energy is absorbed into the Arctic waters through the 12 hours of sunlight at mid-September Not zero, but very little compared to lower latitudes. However, if the open arctic water is exposed, longwave radiation losses increase significantly. 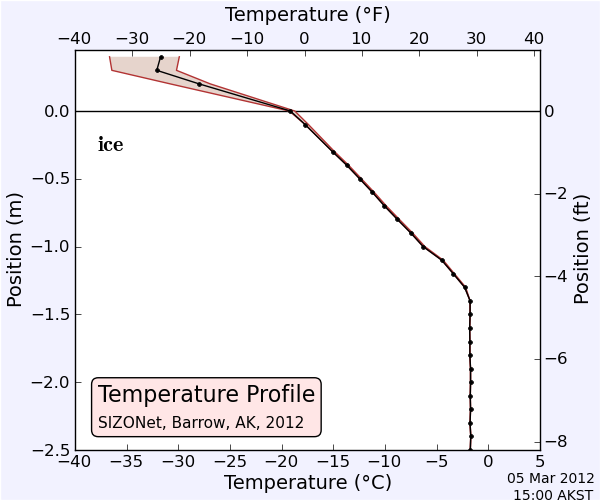 Evaporation losses – zero if ice-covered – go up significantly. Conduction and convection losses increase when the sea ice not present. So, if the Arctic sea ice melts under today’s condition in the Arctic anytime between late August and early April (7 months of the year!~) more heat is lost from the Arctic ocean than can be absorbed into the newly exposed sea water from the sunlight. I think the more likely answer is the polar ice exhibits more of a negative feedback overall. Insulation or lack there of, trumping albedo. Arctic sea ice coverage is within two standard deviations. This is indicative of random natural variability. The average Antarctic land ice mass loss is 69 Gt/yr in 2002-2010. Equivalent to 0.19 mm/yr sea level rise. This is less than the estimated 0.2 to 0.4 mm/yr contribution of glaciers to sea level rise in the last century. Antarctic ice mass loss must have slowed down. How is the volume of the ice irrelevant to how much ice there is? How is how much ice there is irrelevant? No. 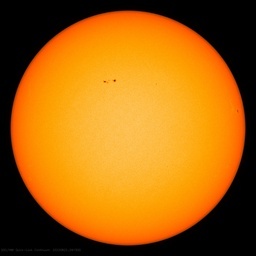 The solar insolation in the Arctic on summer is about 500 W/m^2. The seawater must have a temperature of 37.5 C to radiate 500 W/m^2. If the water is cooler than this, it will be heated by the sun. “However, if the open arctic water is exposed, longwave radiation losses increase significantly. Incoming solar insolation is higher than outgoing longwave radiation. Evaporation does not change the temperature of water because it is latent heat. Conduction and convection depend on air temperature if it is cooler or warmer than water temperature. I guess that depends if the wind is blowing from the open sea or from the frozen sea. Off topic, but Spaceweather made mention several days ago that on the 24th of this month, the Earth will transit “through” the debris field of an old comet. They are calling this a first time event for us. 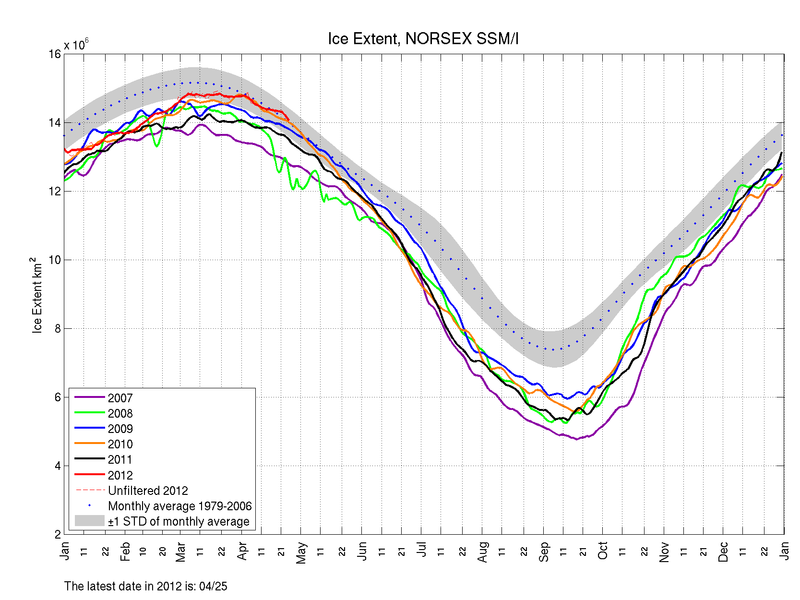 @ Benjamin P…the Sea Ice Index page shows all of the data and anomalies for extent and volumes for both poles. Are you trying to claim that longwave radiation is the only heat loss from Arctic waters? That’s wrong – unless you have this mental image of that iceberg-in-space that I’ve seen in university exams. Well, I am specifically and very exactly talking NOT about some mythical “summer day” in the Arctic – you may pick any one you wish – but the very real mid-September days when this supposed “Arctic sea ice crisis” is at its minimum. So, at the 2012 Arctic sea ice minimum of 3.0 Mkm^2, the edge of the Arctic sea was a rough cap over the arctic going fro the pole down to 80 north latitude. At that latitude on Sept 22 (you may pick another day-of-year if you wish) the ACTUAL clear sky no clouds maximum solar radiation onto a flat surface is 7.0 watts/m^2 at 0700, 57 watts/m^2 at 09:00, 100 at 11:00 through 13:00, back down to 57 watts again at 15:00 (3:00 pm), and only 7 watts/m^2 at 17:00 (%:00 pm). Sunlight is of 0.0 between 17:00 and 07:00 the next morning. So, for these few watts of incoming solar energy, YOU claim all the energy is radiated away by long wave? Convection alone is 35 – 50 watts/m^2 into the wind-swept air. Evaporation depends on air temperature of course – 30 – 70 watts/m^2 is an accepted value. So, calculate this: Emissivity of water and ice are nearly the same. Both are emitting into the same cloudy sky, or clear sky if you wish. Longwave radiation occurs 24 hours per day though. If the surface is open water, then the surface temperature is 2-4 degrees C. 275 to 277 K.
if the surface is ice-covered, then the radiating surface is at air temperature: -10 C to -15 C that day-of-year. Hmmmn. Only (273-15) = 258 K, right? So, open water radiates (278^4)/(258^4) MORE energy than does ice-covered water, right? 35% more energy is lost from open Arctic water in Arctic waters at 80 north in mid-September. The amount of solar energy reflected by sea ice or by open water at sea level is independent of ice volume. Reflection only depends on area and solar elevation angle. (In the arctic, sea ice albedo also depends of day-of-year, varying between 0.93 in early April down to 0.45 in mid-July.) The elevation of the central Antarctic ice cap is NOT changing over time. The total arae of the Antarctic ice cap stays at 14.0 Mkm^2. The area of the ice shelves around Antarctica are NOT changing with time, they are steady at 3.5 Mkm^2. By the way, these ice shelves are NOT included in the NSIDC’s antarctic sea ice totals. Almost all of the record-breaking high 19.0+ Mkm^2 Antarctic sea ice we’ve had recently melts every year. (Unlike the Arctic sea ice which is only 50% first-year ice.) You can play games with claims of multi-year ice in the arctic, but NOT around the Antarctic. So, at the same time that arctic sea ice is at 80 degrees north getting hit with 50 or 100 watts at noon, the antarctic sea ice edge is receiving five TIMES as much radiation on a horizontal square meter. You need 5 times the sea ice loss in the arctic just to equal what is reflected back into space in the antarctic each second. And, at the low elevation angles of the sun in the arctic, even that ratio is too small. RACookPE1978 says: How can the 300 foot thick WAIS melt out if the 2 meter thick Antarctic sea ice continues to gain area AROUND the WAIS every year the past 4 years? davefreer says: What effect does logic then suggest increasing sea-ice will have on the supposed mechanism for melting the ice sheet? Ice loss has been observed in the WAIS in these areas over 4 decades through flow speed, surface elevation, and ice thickness to bedrock. This has happened at the same time as the recent positive trend in Antarctic sea ice. What effect do those observations have on the logic of assuming a simple direct relationship between sea ice trends and ice sheet trends? The ocean isn’t a uniform pool with constant conditions from the surface to the bottom. The characteristics of ice sheets are variable too. Other areas are relatively stable. It is a complex system. The point is that the Antarctic sea ice extent can’t be trotted out as a response to everything. Nice try. pretty picture. Doesn’t work. Now, through the entire last winter in the antarctic, we had about 1.3 Mkm^2 of “excess” antarctic sea ice. EXCESS antarctic sea ice. The ENTIRE period from mid-2011 through 2014 we have been AVERAGING a little over 1 million EXCESS square kilometers of antarctic sea ice. Your “theory” has to work for every day of the past three years! How many cubic kilometers of antarctic continental ice had to “melt” and run off into the antarctic ocean to create that mythical “cold water” insulation-blanket of low convection cycles you claim in your image? Give me the calculations. How much antarctic continental ice melted, where did it melt from to go out evenly and smoothly underneath 19 million square kilometers of the ocean waters surrounding Antarctica to INCREASE the freezing of 1 million EXTRA square kilometers of sea water? Actually figuring out how much ice will form in a water tower is not a trival task. We discussed it at length one day at the engineering firm I worked for in Denver. Not only does ice form on top, but it forms on all sides and only a portion in the middle does not freeze. So two thingies are happening the ice insulates the water and m dot brings enough warm water in the system to help prevent ice accumulation..
Kinda of like the arctic ocean. Well as much as I know is that in Antarctica there are lots of volcanic thermals under the ice, and of course terrestrial volcanoes. If fresh water freezes quicker than sea water, and all glaciers and ice bergs are made from fresh water, where is that all coming from. Is it converted, my son says yes that salt water does freeze.but more slowly. Great but they will see that the natural break up of seasonal sea ice is just another reason to say global warming is the cause. And they get paid for giving this misinformation publically. Wait for the Australian budget tonight, the climate change commission and renewal energy are going to be hit, and so is Antarctica. What, because reflected solar energy is the only reason we measure sea ice, and the answer gives us no other information? Your question, not mine: Name any other reasons arctic and antarctic sea ice matter towards the world’s heat balance. I am NOT the one worried about “arctic” sea ice loss the past few years. I am NOT the hundreds of publicists and propagandists in the CAGW religion who are obsessing about arctic sea ice loss, while ignoring antarctic sea ice gains. I AM however laughing at the hypocrisy of those in the CAGW religion who (deliberately) inflate the problems of losing arctic sea ice (which cools the planet if sea ice minimums continue to shrink!) while ignoring antarctic sea ice gain (which cools the planet if antarctic sea ice levels continue to increase steadily! By the way, in how many years will Cape Horn be closed to sea traffic due to excess antarctic sea ice extents in September and October? Do you really think that heat balance is the only reason we look at ice volume and area? Or, to put it another way, ice volume is not irrelevant to climate science, just because it doesn’t effect one specific part that you care about. Oh you are back Phillip, putting in your claim to fame, by posing silly objections. The point was that AGW’s are or have been claiming sea ice and glaciers were retreating proving global warming. And that Antarctica does not have the benefit of full sunlight part of the year. The same as the Arctic and some countries in the Northern Arctic circle. Antarctica is the coldest place on earth, no polar bears, just penguins, the dear little and big ones. And it is land based, not like the North Pole that has no land under the sea ice. Antarctica and the Southern Ocean currents, does have a lot to do with climate science, and that’s been known since Shackelton went there it does dictate climate cycles. Sorry to burst your bubble of reasoning and knowledge. Who are you to say that that is the only point that matters? That doesn’t make ice volume irrelevant to our understanding of the climate. Ok, volume is important also. Does that make you feel better? By the way the ice concentration anomalies are well to the plus side, so what is your point about the increase in ice volume in Antarctica? My point was that it was silly to dismiss someones question about ice volume as irrelevant, and doing so by saying “well, it’s not relevant to the point I think is important”. But the volume of sea ice and whether the Antarctica has relevance to climate science is that it does. Can’t you understand that. The southern ocean and Antarctica do influence weather and climate. ‘Get over yourself’ Oh me thinks you don’t like being shown up by a woman. No. You almost made a sentence, but not quite. Are you completely oblivious to how hard it can be to figure out exactly what you are talking about? I’m not just being a troublemaker when I ask “what the hell are you on about.” A lot of the time you type stuff that just doesn’t make sense. I can’t be bothered Phillip you belong on a different planet to me, and my English is only geared for those who can understand. Do I really have to explain the problems with that sentence? I’ll give one free cookie to anyone who can explain exactly what that sentence is suppose to mean. OK, rephrase, the volume of sea ice or glaciers in Antarctica does have influence and relevance to weather patterns; that is an important factor to be included in any climate scientific research. Now if the ice is not reducing in volume Phillip, and is increasing, the people who are telling us it is shrinking because of global warming are wrong and corrupting the data to prove their hypothesis. They are lying in other words. I’m sorry Anthony I can’t be bothered with this guy. I am not sitting an English essay. The AVERAGE altitude, of the entire Antarctic continent exceeds 10,000 feet (read that somewhere). Hence atmospheric CO2 over the Antarctic continent, is substantially lower than over the Arctic ocean, which is at sea level, give or take a couple of meters. In fact it is only about 2/3 of the Arctic CO2. So that means Antarctic CO2 today is actually less than Mauna Loa CO2 was in the IGY of 1957/58, when recording of CO2 started. Currently ice growth slowed. The reason is the blockade polar vortex, which is formed in regions of strong ionization by cosmic rays. Yes there is a big mountain (old volcano) that a plane crashed into some years ago. I’d love to go there and meet the tame penguins and seals. But – after that last venture getting bogged in ice packs, might prefer to visit somewhere less cold. Maybe the Red centre or New Zealand. Nope. You’re the one who said that not me. I specifically said heat transfer by conduction and convection depend on air and water temperatures. But assuming they are equal, the ice water is warming, not cooling, when exposed to sunlight. September 22 is autumn equinox. June 21 is summer solstice. Are you confusing autumn for summer? Of course. But that’s not what you said previously. You said water emits more longwave than absorbs solar radiation. Wrong. Not on summer. Do the math and you will see I am right. Rephrase? Why would you do that? You just had a go at me twice when I pointed out that your sentence made no sense, and now with no apology or acknowledgement of the issue, you suddenly change your tune. Well, I guess that beating me is the important thing after all, so who cares about any of that. Yep, and the weather patterns have influence on and relevance to sea ice and glaciers. I never said anything about that. All I did was point out that it was silly to dismiss sea ice volume as irrelevant to this discussion. And, sitting an English essay? Sorry if making sense is too much work for you. ren: it is coming into their winter Or nearly is. From what I know, ice growth or increases come and go depending on the season and daylight hours. I did rephrase it Phillip for you to get a better understanding. You started it Phillip, so don’t blame me for responding to insults. I think I will give you a ring and tell you what I really think of you. That’s a load of crap. The original sentence made no sense whatsoever. You have refused to acknowledge this, and now you claim that you rephrased it for me to get better understanding, not because it was gibberish the first time round. Lol, looney alert!! Meh, it’s ok. One more crazy woman in my life couldn’t make that much difference. Actually Phillip I was going to be kind to you and have a good laugh with you. Maybe you are making woman you know crazy, LOL> Anyway goodnight, I want to feed me with trout and the dogs with kangaroo, and sit down and watch The Voice and Bargain Hunt. Nite folks. Wrong because sea ice melts on summer/spring and grows on autumn/winter. You must think the Arctic sea is in the southern hemisphere. See and learn. Gawd, people actually watch those shows? Anyway, whatever you do, don’t ever acknowledge a mistake. Even one as obvious and simple as a sentence that made no sense. lol, what on earth did I say in my post back a little ways that put it in moderation? Hiding uncomfortable facts by sinking the debate in a morass of intractable detail. A signature of political pseudoscience such as AGW. Start with the politically determined answer. Then sink ay real debate with a heap of technical detail with no underlying structure, going nowhere, answering nothing. Its what children do when they cover their ears and shout LALALALALALA. Your summary “Wrong because sea ice melts on summer/spring and grows on autumn/winter.” = DEAD WRONG. Look at the plots again on the WUWT Sea Ice page. Arctic sea ice is at its maximum sometime between mid-March (the equinox) and mid-April each year. Arctic sea ice is at its MAXIMUM in “spring”. Arctic sea ice reaches its minimum in mid-September each year – and is very consistent since records started in 1979 about this date. Hint: Skip the arbitrary and useless “spring” and “summer” and use actual dates. You will be less confused about Arctic and Antarctic as well. 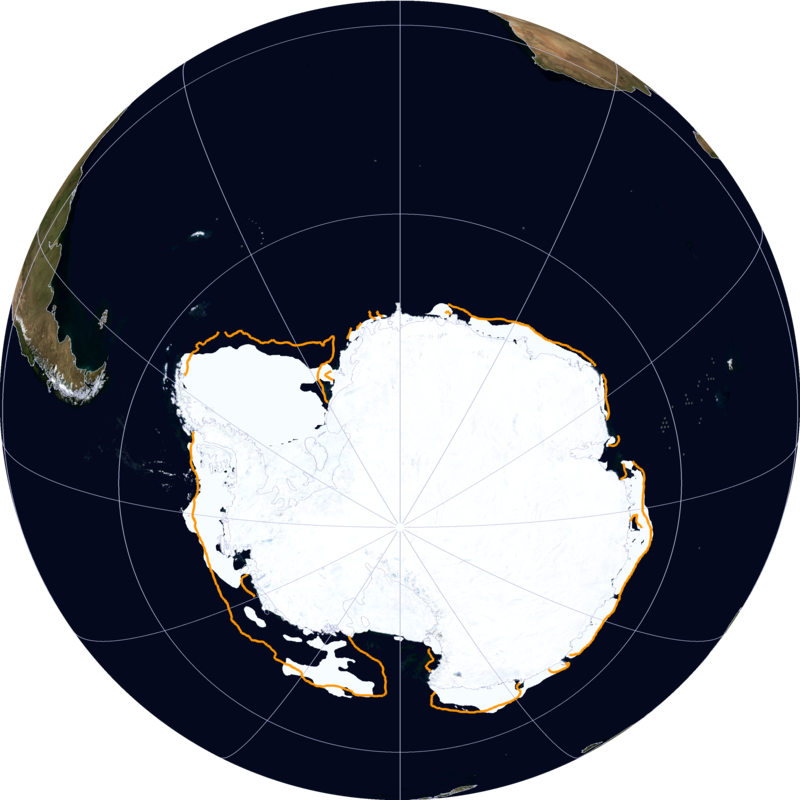 Antarctic sea ice reaches its minimum slightly earlier (during mid-February normally) and reaches its maximum between mid-September to mid-October each year.) This is why the total global sea ice extents plots has more than two peaks each year. But Arctic and Antarctic sea ice is constantly melting (retreating) and freezing (expanding) EVERY HOUR OF EVERY DAY OF EVERY YEAR. At any given day of year, more area may be added (frozen) than melted, or more area may be expanded and blown south or blown back north and compacted (Arctic). The anomaly is the difference between any given day-of-year’s average area and the satellite-measured actual area. The area is the surface (not volume) reflecting or absorbing sunlight on any given day-of-year. Do you claim anything different? Do you have some other definition of “spring” and “summer”? There was a meaningless claim above that “the Arctic” receives 500 watts/m^2 “in the summer” …. But, in mid-September, the actual numbers show the edge of the actual Arctic sea ice at its minimum in 2012 received only 100 watts/m^2 for 2 hours per day. The rest of the day, that square meter of “arctic” was getting as little as 7 watts/meter^2. Overnight, that square meter received 0.0 watts from the sun. My statement stands: If ANY region in the arctic melts (is changed from “covered by sea ice” into “open ocean water”) between early September each year through early April the next year, that square million (thousand, hundred, or tens) of kilometers of “open ocean” will lose more heat than can be gained from the sunlight hitting it. Now, through the short midst of the five month Arctic “summer” between April and August each year, more heat energy IS GAINED when open water is struck by sunlight. But ONLY during those few days of summer. The rest of the year? The remaining seven months of the year? Less arctic sea ice means a cooler planet. The Arctic sea ice anomaly IS negative all year, has been negative for many years now. Thus, 5 months of slightly higher heat gain (compared to “1970’s normal”), and seven months of increased heat loss (reflection) into space! To repeat what was clearly stated above: Increased sea ice loss ANYTIME between early-September through early April in the arctic means MORE heat lost by longwave radiation and convection and evaporation than can be gained by solar radiation. Not so in the Antarctic. Every million square kilometers of “excess” Antarctic sea ice present ANYWHERE around the Antarctic ANYTIME of the year yields a cooler planet due to increased heat reflection because the edge (the ever-moving ever-melting and re-freezing part of the sea ice is that is measured by the antarctic sea ice anomaly) is many thousand kilometers closer to the equator than its arctic counterpart. And the Antarctic sea ice anomaly has been POSITIVE every day since May 2011. Increasingly positive at that: Do you want to predict when the Cape Horn will blocked by sea ice? 8 years? 10? 12? This may have been covered elsewhere, but I can’t help but laugh when Warmists say that glacier ice melt in Antarctica explains the increased sea ice anomaly for that continent–as runoff. The last time I checked (today) the positive anomaly for ice extent in Antarctica is not where the JPL describes dire glacial ice melt. Any thoughts? The sea level rise is terrible. We can already see it here in Arizona. The gulf of California is now visible…just a few miles south of Tucson. Grab your life rafts and pray to whatever deity is on your mind. Serious question. “They” say that “Antarctica is losing land ice as a whole, and these losses are accelerating quickly.” http://www.skepticalscience.com/antarctica-gaining-ice.htm. So, which is it? Is it melting or freezing as a whole? May 17, 2014 at 5:25 pm	— do note this ‘skeptical science’ – which is listed on the sidebar of this site. Go and see what it says. North Korea calls itself the the Democratic People’s Republic. Is it democratic or belonging to the people, or even a republic? Ask the same type question about the title of that site. What is interesting about the post you quote is the weasel errors and omissions – as an example of the first that the antarctic sea Ice is not important ‘because it melts in summer.’ – in actual fact it reaches its maximum extent (a lot further north than Norther Hemisphere ice – and therefore much more relevant as far as reflection of solar input is concerned) in September (southern hemisphere spring) and then shrinks across the summer – reaching its minimum in March- autumn. So in fact for the period maximum sun it is quite present and effective, and as RACookPE1978 points out, a lot further North than the arctic ever gets South. Secondly omissions such as what is meant by ‘accelerating quickly’ — the only (relatively small) evidence of ice sheet ‘loss’ or movement are ‘quick’ on the geological scale only. Helpful answer. No weaselly intent meant. But more to my specific question. Western Ant. Has that one popular melting glacier that will be gone supposedly in a few hundred years. (It bugs me that they never assume any change…. It’s a wonder they expect the sub to come up the next day… I digress). What about ice on the rest of the continent. You’re saying it’s all doing a post-ice-age shrink. But I’ve also heard (sorry, can’t remember where) that it’s gaining ice. notaWARMonger – It’s covered at a great deal of length here – http://wattsupwiththat.com/2014/05/17/pseudoscientists-eight-climate-claims-debunked/#more-109448 – not just the article but the comments. Part – a small part of W. Ant – further south than parts which are not showing the same, may in the course of the the next 500 – few thousand years slip seawards. Antarictica is cooling, and away from the coast does not experience positive temperatures. So: I’d be curious to know just where the continental ice loss occurs and if so, how. What I don’t get is this: Since the early days of the climate debate I understood (or so I thought) that melting ice is largely responsible for rising sea levels (that back then would wipe out whole cities). But if, on the other hand, the ice caps seem to grow – why is no one talking about the oceans receding from these “threatened” shorelines? Last I read in elementary school, volume is a function of area x depth. This article tells only part of the story and all the commentators I read above seem to overlook that not so insignificant equation. So, until this or another article compares the depth, as well as the area, over time, the truth will remain obscured, and any comments premature. No, not true. This canard was brought up several days ago. See druphil’s complaint, and my response – repeated below. The SOLE concern about Arctic sea ice is the “polar amplification” of darker open ocean water absorbing more solar energy – a premise that requires only area, NOT volume. Sea ice “volume” is brought in by the CAGW religion as a hedge by claiming that multi-year ice is thicker, and therefore less likely to melt each year. Virtually ALL Antarctic sea ice melts every year, so multi-year ice does not exist as a reflective surface around the Antarctic. The amount of solar energy reflected by sea ice or by open water at sea level is independent of ice volume. Reflection only depends on area, [albedo at that solar elevation angle), and solar elevation angle. (In the arctic, sea ice albedo also depends of day-of-year, varying between 0.93 in early April down to 0.45 in mid-July.) The elevation of the central Antarctic ice cap is NOT changing over time. The total area of the Antarctic continental ice cap stays at 14.0 Mkm^2. It seems we are talking about two separate phenomena. Albedo is, of course, related to surface area; but the contribution of Antarctic melting to sea level rise is related to volume lost. My ultimate point is that single data or single year can’t be rationally used as arguments for any trend. But the other facts remain, glaciers receding on most continents, permafrost melting; then there’s the mechanism: steadily rising atmospheric CO2 that is transmits visual light but is opaque to heat. Deniers suggest CO2 change is irrelevant because of it’ relatively low concentration in the air, but in complex systems, the absolute value is less important than the % CHANGE of a system constituent. Atmospheric and water temperatures aren’t rising linearly due to the various other phenomena such as the pacific and atlantic cycles that are 10-20 and 7-10 year cycles respectively, (one of them is in the “cool phase” at present which could explain the lack of temperature rise in the last 7-10 years). In the end, the predominance of facts and the understanding of mechanisms supports man made climate change.